As part of #GivingTuesday, Sensible Reason is highlighting the unique way that one of our team members helped to raise close to $5,000 for the UN agency, UNICEF. To find out more about #GivingTuesday and organizations that you can give to, check out the #GivingTuesday website. As Kristen Grennan, a manager at Sensible Reason, reached mile 18 of the ING New York City Marathon on the chilly fall Sunday afternoon in her fundraising T-shirt with her name scrawled across the chest, her hamstrings throbbed with pain. Stopping at a medical tent, she didn’t think she could continue, but the thought of letting people down kept her going. “I couldn’t tell 75 people that donated that I didn’t finish,” she said in a slight Long Island accent. Kristen raised $4,260 for the United Nations Children’s Fund’s (UNICEF) in two months and raised $4,826 in total. She joined the team late after a friend told her of an open spot, putting her at a disadvantage in fundraising and training. Kristen’s passion to combat poverty made UNICEF, a humanitarian organization that provides children with a safe and healthy childhood, a natural fit. 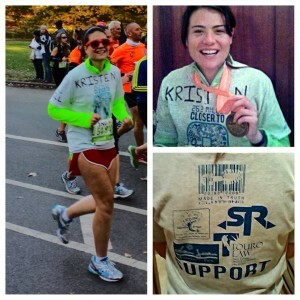 Kristen, 23, ran the 26.2-mile course through the five boroughs on November 3, 2013, along with nearly 50,000 other runners, in 5 hours and 26 minutes. Geoffrey Mutai defended his title when the race returned after last year’s cancellation, clocking in at 2 hours and 8 minutes. But time wasn’t important to Kristen; this marathon was about running for a cause and with a purpose. As well as fundraising, she ran in memory of her brother, Will, who was also a runner. 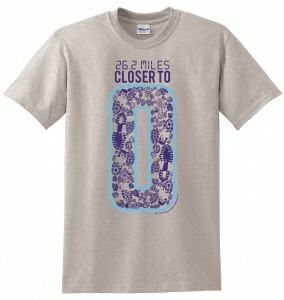 Surpassing her goal of $3,500, she attributes the success to her idea to incentivize donations with T-shirts. Kristen was able to team up with Made in Truth Clothing to have over 80 t-shirts designed specifically for donors who gave $1 per mile or more (for a total of $26.20 or more). 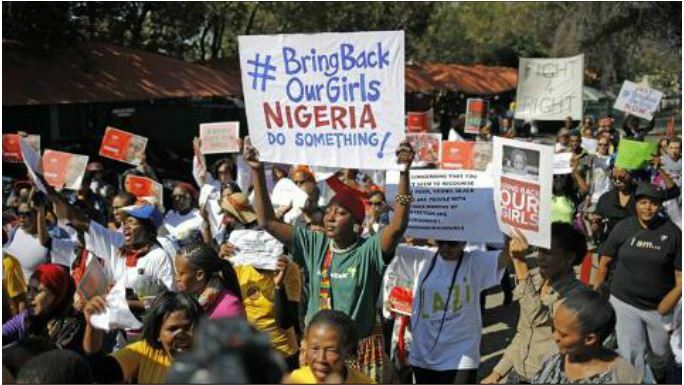 As the only person on the UNICEF team to use this tactic, she was able to catch up after her late start. Kristen Grennan was no stranger to overcoming obstacles in order to contribute to a bigger cause. Born and raised in Massapequa, New York, she ran the Long Island Marathon at 17 as the youngest fundraiser on her team for the Leukemia and Lymphoma Society. She raised over $6,000 and finished the race around 3 hours and 30 minutes. “I’ve always been ambitious regardless of my age,” Grennan said. Committed to helping others, Grennan has volunteered in Tanzania, taught English in France and regularly volunteers for the Girl Scout’s United Nations Team and Oxfam America, an organization devoted to ending poverty. She currently works at Touro Law Center on Long Island as the assistant director of digital media and marketing. Her history as a cross country and distance runner helped combat her late start training, but despite 2 months of work, she knew the marathon would still be a challenge. When her family saw her near the finish of the race, they couldn’t tell that she was in pain. Trudging along with her head down, Kristen felt like she was going to die, until she heard her name being called. “When we cheered, she perked up!” said Kristen’s mother, Georgene. Kristen thinks she will stick to half marathons from now on, but is proud non-the-less that she finished the race. “I think that’s the great thing about running, it shows you physically you can do anything,” Grennan said. 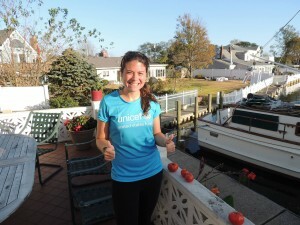 Kristen Grennan’s fundraising page is still active in response to UNICEF’s Philippine Typhoon relief efforts. Please consider making a donation to UNICEF here!